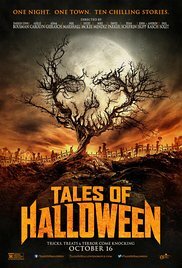 Named “the best horror anthology since Trick ‘r Treat” by Fangoria and “among the best Halloween-themed horror movies ever made” by DailyDead, this critically acclaimed film weaves together ten chilling tales from horror’s top directors. Ghosts, ghouls, monsters, and the devil delight in terrorizing unsuspecting residents of a suburban neighborhood on Halloween night. Director : Darren Lynn Bousman, Dave Parker, Axelle Carolyn ……. I thought I’d traditionally watch a fun horror with Halloween. The title of this movie fitted perfectly and also the cover seemed convincing enough. Sadly enough it was far from scary or creepy. A succession of short horror stories with the theme Halloween. They all turned out to be pretty innocent stories. Maybe they can serve as reading material. Preferable reading it to a gang of kids who are already scared silly when you raise your voice. The only effect it had on me was that I was yearning to see the credits. I was fed up with Halloween after the fifth movie. It’s a film resembling the “Tales from the crypt” episodes. An anthology series, based on the eponymous comic books, you could see on television in the 90s late in the evening. A series that consisted of a weekly short horror story told by the crypt keeper. The crypt keeper is replaced by a local radio DJ (Adrienne “Creepshow” Barbeau) who uses a ghostly voice to read some binding text for the 10 short films. As expected, the level of these stories alternated from high to (unfortunately in general) disappointingly low. Are you a fan of cameos (guest appearances)? Well I can definitely recommend this movie if so, because there are plenty of cameos in it. Among others you can see the following persons: John Landis, Greg Grunberg, John Savage, Booboo Stewart and Kristina Klebe. Apparently even the legendary John Carpenter appeared somewhere, as I’ve read. Are you hoping for some creepy stories that give you the chills, you’ll be disappointed I bet. It’s rather all playful and downright comical. For me the most successful short stories were “Friday the 13 st” (a comic slasher story), “Trick” (a typical story with a subtle twist) and “Sweet tooth” (typical Halloween story in an attempt to look gory). But especially “The night Billy raised hell” I found amusing and surprising. Particularly the rendition of Barry Bostwick as the personification of evil. A satanic caricature. The least successful stories were “Ding Dong” (absurdly exaggerated) and “This Means War” (the most ridiculous and out of place story). It’s not exactly “Scary movie“, full of ridiculous, predictable references to infamous horrors, but you’ll soon be giggling instead of shivering. But if you get nostalgic feelings while thinking of “Creepshow” and “Tales from a crypt“, this will delight you, even though these classics outweigh this attempt. It should have been a bit scarier, darker and more frightening. As a real Halloween night should be. Woehahahahahahahahahaha ….